General troubleshooting and pipe repair. …and when we’re done installing your septic system we’ll plant some grass and make sure it looks like we were never there. Here are some of the common problems and symptoms that surface with septic systems. Wet drainfield (leach field) – if it’s super saturated it may be in need of service. Lush grass and plant growth over the leach field likely indicates problems brewing. 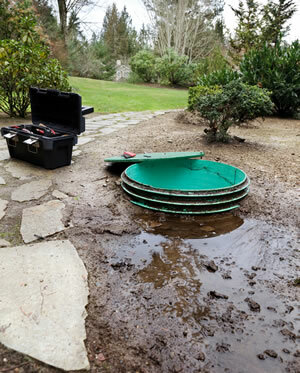 Collapsed septic tanks can leak and cause puddling near the surface. This is particularly true for older metal tanks. Nearby tree roots can wreak havoc on leach fields. Clay soil can become hardpan and block leach field flow. Septic tank inlet or outlets can become blocked. Sluggish home plumbing can indicate septic system backup. Sometimes your old tank just needs the sludge to be pumped out. Your septic system’s job is to filter your waste water and protect your drinking water. Sewage and grey water from showers and sinks are routed from your home’s pluming to the septic tank. 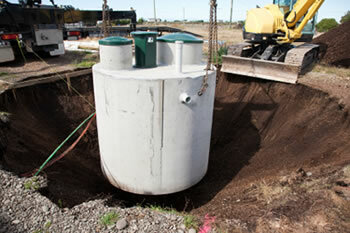 Solids are collected in the septic tank and processed by microorganisms. The liquid that remains is called effluent and it’s toxic to your well water supply and our water sheds. A properly designed and maintained septic system will clean and filter out harmful pathogens and viruses from waste water before they come in contact with your well water. Poorly designed and maintained systems have the very real potential to spread deadly waterborne diseases. That’s why it’s such serious business and you really want to have a licensed septic professional installing your system. There’s a big reason we got into doing septic work ourselves. In years past, many of our bigger landscaping projects would get held up by septic contractors that couldn’t deliver on schedule or didn’t do what they were supposed to do. Now that’s a non-issue because we do all of our own septic system installations. Our projects don’t get hung up because we’re not depending on outside contractors. Your backyard is going to get ripped up by an excavator while installing your septic tank or drain field, that’s a given. After the job is done, who do you think is going to rake-out all the rocks from what was once your lawn? Well, it certainly won’t be the septic company you hired. Nope, they just do septic and they’re definitely not going to plant grass or shrubs for you before they leave the job site. The reason we know this to be true is because we used to clean up after septic contractors that worked on our customers’ properties and it was no small chore… We’ve heard all the horror stories. When we’re done with your property, you’ll have septic system “built to code” and your property will look better – not worse. In Need of Septic Services?